Dead Days Beyond Help is the duo of Alex Ward (guitar/vocals) and Jem Doulton (drums). Since forming in 2006, DDBH have honed a compositional approach heard to its fullest extent on their 2014 Believers Roast release “SEVERANCE PAY”, described by The Wire Magazine as “a reminder that there are still thrills aplenty to be gained from the pursuit of complexity… as playful as it is heavy, as atmospheric as it is cerebral”. 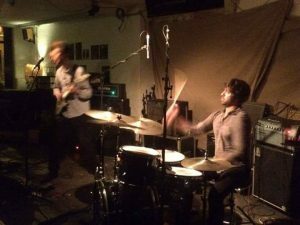 In their live performances, these variously intricate, sweeping and violent compositions sit side by side with free-wheeling improvisational excursions (reflecting the members’ work with the likes of Steve Noble, Alan Wilkinson and Thurston Moore) and the whims of the moment, which could involve a leap into either a wall of flattening noise or the most emotionally direct country song. In negotiating this dizzying range of materials, DDBH bypass the pitfalls of irony and the obstacle course of genre by the simple guiding principle: intensity-at-all-costs. “Ward’s guitar work leaps between metallic crunch, Fripp-esque tangle and Chadbourne choogle with astounding energy and precision, while Doulton’s drumming swings with commensurate joy and fury” – Joseph Stannard, The Wire. “Dead Days Beyond Help are just the job after a hard day at the void machine, their precise and frenetic compositions blowing away the debris and cleansing the mind.” – Simon Lewis, Terrascope Online. For BOOKING enquiries please contact TOM.